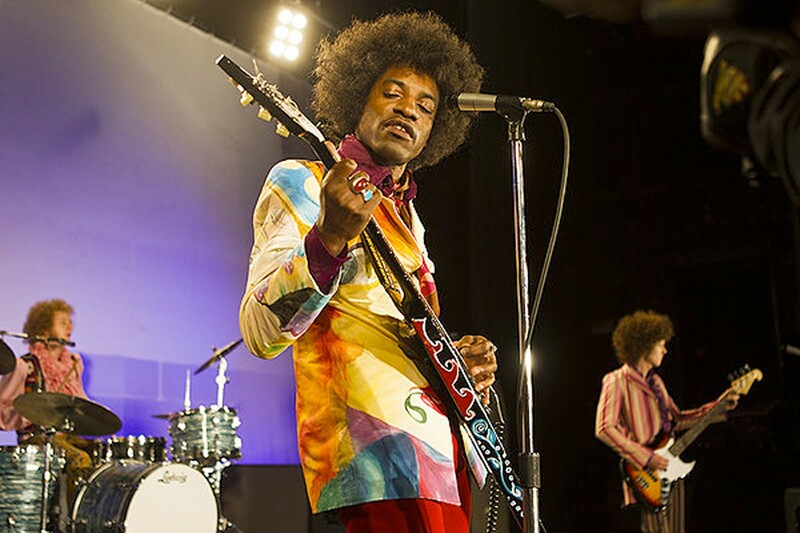 John Ridley's film is a thing that exists against all odds: a Jimi Hendrix biopic without a single lick of authentic Hendrix music, due to his estate refusing to grant the rights. It follows a year in the life of Jimi (André Benjamin) as his career incubated in London, ending just shy of his triumphant American re-debut at the Monterey Pop Festival in 1967. While there are references made to "the album" and "the singles," the words "Are You Experienced" and "Purple Haze" are never spoken aloud. Original recordings by Bob Dylan and others are heard, but the closest to canonical Hendrix music is a re-creation of his legendary live performance of "Sgt. Pepper's Lonely Hearts Club Band," because it was evidently easier to get the publishing rights to the Beatles. Ridley distracts from this handicap by shooting the film like a contemporaneous New Wave film, with untraditional editing and sound design; in a particularly captivating sequence, the sound drops out to just Hendrix's fingers plink-plinking on the strings, with no tones or music. But Jimi: All Is By My Side's real strength is André Benjamin, who channels Jimi as though he's been him all along. That most of the original man's spoken words are public domain probably helped.